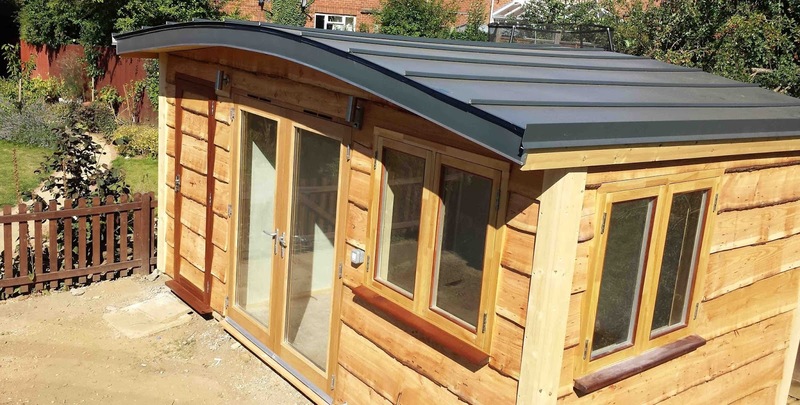 "In liaison with Aled at Tata-Steel in Chester, we have developed a completely new kind of roof that is fully compliant with permitted development and offers a real alternative to the typical flat roof cedar box," writes Richard Grace of Garden Structures. 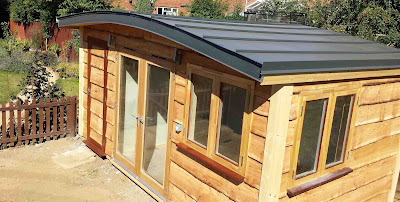 "The building in the photos is a garden office recently installed by us in Northampton for a software engineer and his wife who is a teacher. "The roof is curved and tilting only 1 degree to rear. 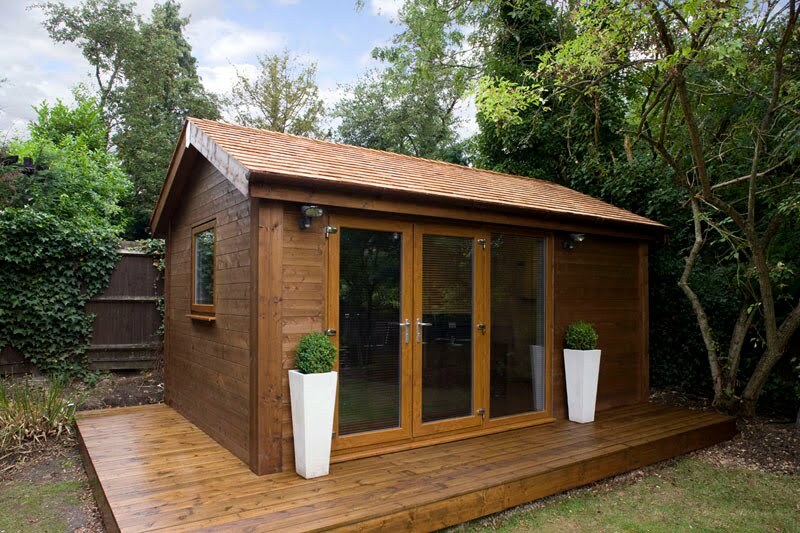 It is insulated with a GSL manufactured curved structural insulated panel containing 100mm of celotex insulation. The total thickness of the roof is 145mm and expected no maintenance lifespan of over 30 years. At the top of the curve the roof measures 2.5m from the ground and is fully compliant with pd. Our calculations show that the canteleverel canopy shown here at 400mm could extend to 500mm without further support. The lowest two points of the redwood tgv wooden ceiling (part of the sip) is supported by a visible curved wooden truss is 2100mm (ok for all but the very tallest). 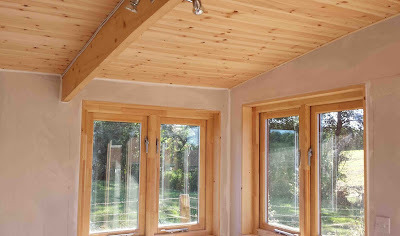 The internal walls are finished in plasterboard (dry lined) with redwood window reveals. 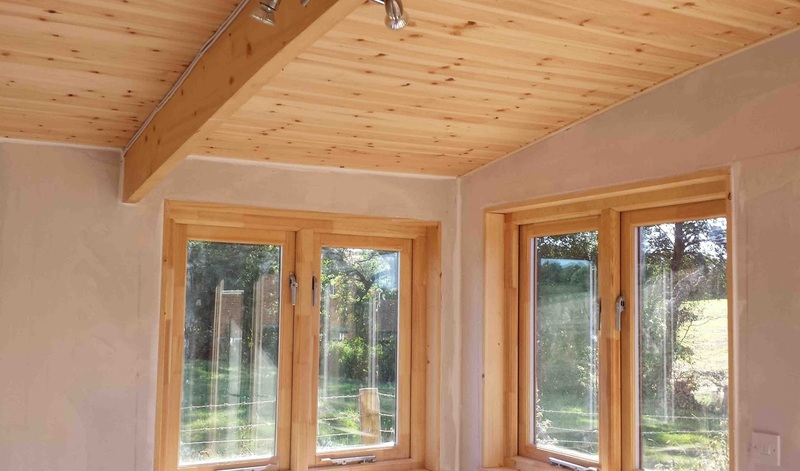 "This office has a particularly high insulation spec featuring a new kind of window developed by us this year with help from Bernard of Illingworth Ingham in Manchester and is clad in 20mm rough sawn random wany edge siberian larch. All structural timber was supplied by Colin Myers Widnes and Chester. "We are currently working on a 6.5m open span of the same system in a pd building with 30sqm footprint close to central london for use as a therapy studio for an established practice. Part of the client consideration was the number of surrounding properties looking down on the roof."